document regarding this migration. So I did it with my experience and knowledge. Hive stores the metadata in some databases, ie it stores the data about the tables in some database. For developement/ production grade installations, we normally use mysql/oracle/postgresql databases. Here I am explaining about the migration of the hive with its metastore database in mysql. The metadata contains the information about the tables. The contents of the table are stored in hdfs. to the hdfs of older cluster. For migrating a hive installation, we have to do the following things. 3) take the mysql metastore dump. hdfs://ip-address-old-namenode:port and replace with hdfs://ip-address-new-namenode:port and save it. new-namenode is the ipaddress of namenode of new hadoop cluster. 6) After doing the above steps, restore the editted mysql dump into the mysql of new hadoop cluster. 7) Configure hive as normal and do the hive schema upgradations if needed. Rhipe was first developed by Saptarshi Guha. Rhipe needs R and Hadoop. So first install R and hadooop. Installation of R and hadoop are well explained in my previous posts. The latest version of Rhipe as of now is Rhipe-0.73.1. and latest available version of R is R-3.0.0. If you are using CDH4 (Cloudera distribution of hadoop) , use Rhipe-0.73 or later versions, because older versions may not work with CDH4. Rhipe is an R and Hadoop integrated programming environment. Rhipe integrates R and Hadoop. Rhipe is very good for statistical and analytical calculations of very large data. Because here R is integrated with hadoop, so it will process in distributed mode, ie mapreduce. Hadoop, R, protocol buffers and rJava should be installed before installing Rhipe. We are installing Rhipe in a hadoop cluster. So the job submitted may execute in any of the tasktracker nodes. So we have to install R and Rhipe in all the tasktracker nodes, otherwise you will face an exception “Cannot find R” or something similar to that. If these two are working fine, This means that the protobuf is properly installed. Download the rJava tarball from the below link. Now you can execute you Rhipe scripts. R is a free software that is for statistical and analytical computations. It is a very good tool for graphical computations also. R is used in a wide range of areas. R allows us to carryout statistical analysis in an interactive model. To use R, first we need to install R program in our computer. R can be installed windows, Linux, Mac OS etc. In Linux platforms, we usually install by compiling the tarball. Installation of R in Linux platforms is explained below. If you are using Redhat or CentOS distribution of linux, then you can either install using tarballs or rpm. But latest versions may not be available as rpm. Installation using rpm is simple. Then installation is very simple. Just do the following commands. R is available as tarball which is compatible with all linux platforms. Latest versions of R are available as tarball. The installation steps are given below. The above step may fail because of the lack of dependent libraries in your OS. If it is failing, install the dependent libraries and do the above step again. If this is done successfully, do the following steps. If R prompt is coming, your R installation is successful. Apache Hadoop is an open-source software framework that supports data-intensive distributed applications, licensed under the Apache v2 license. It supports the running of applications on large clusters of commodity hardware. Hadoop was derived from Google’s MapReduce and Google File System(GFS) papers. Hadoop development needs a hadoop cluster. A trial hadoop cluster can be setted up in minutes. In my previous blog post, I have mentioned about hadoop cluster set up using tarball. But for production environments, tarball installation is not a good approach. Because it will become complex while installing other hadoop ecosystem components. If we have a high speed internet connection, we can install hadoop directly from the internet using yum install in minutes. But most of the production environments are isolated. So internet connection may not be there. There we can perform this yum install by creating a local yum repository. Yum install will work with REDHAT or CentOS linux distributions. Here I am giving the explanation of Cloudera Distribution of Hadoop installation. The ports necessary for hadoop should be opened. So we need to set appropriate firewall rules. 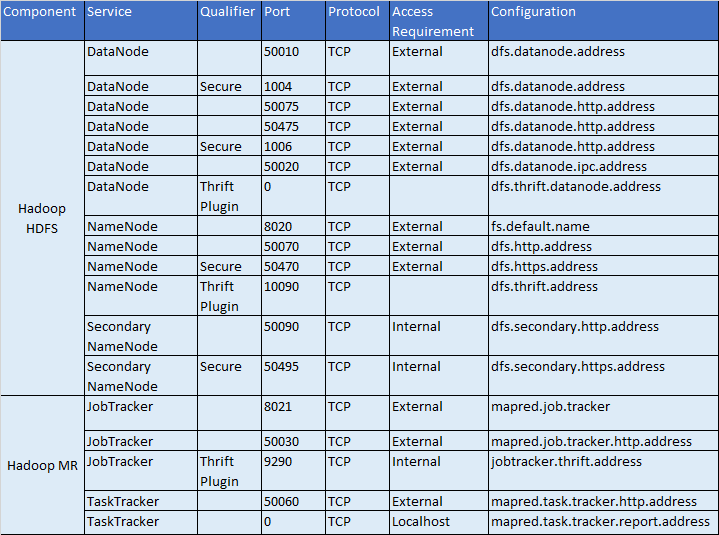 The ports used by hadoop are listed in the last part of this post. If you are not interested in, you can simply switch off the firewall. Simple installation and setting JAVA_HOME may not points the newly installed java as the default one. It may still point to the openjdk if it is present. So to point to the new java. This will a list of java installed in the machine and to which java, it is currently pointing. This will ask you to choose any java from the list. Exit from this by pressing cntrl+c. To add our sun java to this list. Do the following step. This will add our newly installed java to the list. and choose the newly installed java. Now java –version will show sun java. Download the Cloudera rpm repository from a place where you have internet access. Download the repository corresponding to your OS version. The repo file corresponding to different operating systems are listed below. Copy the repo file and download the repository. You can download it rpm by rpm or do a repo-sync. Repo-sync is explained in my previous post Creating A Local YUM Repository. Once this is done, create a local repository in one of the machines. Then create a repo file corresponding to the newly created repository and add that repo file to all the cluster machines. After this we can do yum install similar like a machine having internet access. Now do a yum clean all in all the cluster machines. Do the following steps in the corresponding nodes. The following steps explains the installation of MRV1 only. Normally we run datanode and tasktracker in the same node. Ie these are co-located for data locality. Now edit the core-site.xml, mapred-site.xml and hdfs-site.xml in all the machines. Sample configurations are given below. But for production set up, you can set other properties. simultaneously by a task tracker. Then create hadoop.tmp.dir in all the machines. Hadoop stores its files in this folder. mapred.tasktracker.map.tasks.maximum :- this will set the number of map slots in each node. mapred.tasktracker.reduce.tasks.maximum :- this will set the number of reduce slots in each node. This number is set by doing a calculation on the available RAM and jvm size of each task slot. The default size of the task slot is 200 MB. So if you have 4GB RAM free after sharing to OS requirements and other processes. We can have 4*1024 MB/200 number of task slots in that node. So we can have 20 task slots which we can divide into map slots and reduce slots. Usually we give higher number of map slots than reduce slots. In hdfs-site.xml we are giving the replication factor. Default value is 3. Now go to the namenode machine and login as root user. Then from cli, switch to hdfs user. In the namenode machine, execute the following command as root user. You can check whether the service is running or not by using the command jps. Jps will work only if sun java is installed and added to path. In the Secondary Namenode machine, execute the following command as root user. In the Datanode machines, execute the following command as root user. Now the hdfs is started. Now we will be able to execute hdfs tasks. In the jobtracker machine login as root user, then switch to hdfs user. Then create the following hdfs directory structure and permissions. You can check the namenode webUI using a browser. If hostname resolution is not happened correctly, the hostname:port may not work. Now our hadoop cluster is ready for use. With this method, we can create hadoop cluster of any size within short time. Here we have the entire hadoop ecosystem repository, so installing other components such as hive, pig, Hbase, sqoop etc can be done very easily. Making a Pseudo distributed Hadoop Cluster. Distributed : Data is split into blocks and stored in different data nodes for faster execution by doing computation nearer to data. filesystem which stores metadata in NameNode and application data in DataNode. Fault tolerance is achieved by replication factor of 3. It is a framework used for parallel processing humungous data sets using clusters. It has two phases. Map phase : In this phase the data need to be separated out which need to be processed. Reduce phase : In this phase the data from the map phase is collected and analysis has to be done. A cluster is a group of computers connected via a network. Similarly a Hadoop Cluster can also be a combination of a number of systems connected together which completes the picture of distributed computing. Hadoop uses a master slave architecture. Child nodes are attached to the main node. Data node has a configuration file to make itself available in the cluster .Again they stores data regarding storage capacity(Ex:5 out f 10 is available) of that particular data node. Data nodes are independent ,since they are not pointing to any other data nodes. Manages the storage attached to the node. There will be multiple data nodes in a cluster. Schedules and assign task to the different datanodes. Checks whether all the data nodes are working properly. If not, reschedule the tasks. Job Tracker and task tracker works in a master slave model. Every datanode has got a task tracker which actually performs the task which ever assigned to it by the Job tracker. Secondaryname node is not a redundant namenode but this actually provides the check pointing and housekeeping tasks periodically. Standalone (local) mode: It is used to run Hadoop directly on your local machine. By default Hadoop is configured to run in this mode. It is used for debugging purpose. Pseudo-distributed mode: It is used to stimulate multi node installation using a single node setup. We can use a single server instead of installing Hadoop in different servers. Fully distributed mode: In this mode Hadoop is installed in all the servers which is a part of the cluster. One machine need to be designated as NameNode and another one as JobTracker. The rest acts as DataNode and TaskTracker. A Single node cluster is a cluster where all the Hadoop daemons run on a single machine. The development can be described as several steps. Hadoop is meant to be deployed on Linux based platforms which includes OS like Mackintosh. Larger Hadoop production deployments are mostly on Cent OS, Red hat etc. GNU/Linux is using as the development and production platform. Hadoop has been demonstrated on Linux clusters with more than 4000 nodes. Win32 can be used as a development platform, but is not used as a production platform. For developing cluster in windows, we need Cygwin. Since Ubuntu is a common Linux distribution and with interfaces similar to Windows, we’ll describe the details of Hadoop deployment on Ubuntu, it is better using the latest stable versions of OS. This document deals with the development of cluster using Ubuntu Linux platform. Version is 12.04.1 LTS 64 bit. This is used by the Hadoop scripts to manage remote Hadoop daemons. Download a latest stable version of Hadoop. Here we are using Hadoop 1.0.3. If it is showing a 64, then all the softwares(Java, ssh) must be of 64 bit. If it is showing 32, then use the softwares for 32 bit. This is very important. For setting up hadoop, we need java. It is recommended to use sun java 1.6. This will show the details about java, if it is already installed. If it is not there, we have to install. Download a stable version of java as described above. For installing a .bin file, go to the directory containing the binary file. Now close the terminal, re-open again and check whether the java installation is correct. This will show the details, if java is installed correct. Now we are ready with java installed. We have to create a separate user account for running Hadoop. This is recommended, because it isolates other softwares and other users on the same machine from hadoop installation. Here we created a user “user” in a group “hadoop”. In the following steps, If you are not able to do sudo with user. Then add user to sudoers group. This will give user the root privileges. Hadoop requires SSH access to manage the nodes. In case of multinode cluster, it is remote machines and local machine. In single node cluster, SSH is needed to access the localhost for user user. If ssh server is not installed, install it before going further. Download the correct version (64bit or 32 bit) of open-ssh-server. Here we are using 64 bit OS, So I downloaded open ssh server for 64 bit. The downloaded file may be a .deb file. This will install the .deb file. Now we have SSH up and running. user@ubuntu:~$ ssh-keygen -t rsa -P ""
Here it is needed to unlock the key without our interaction, so we are creating an RSA keypair with an empty password. This is done in the second line. If empty password is not given, we have to enter the password every time when Hadoop interacts with its nodes. This is not desirable, so we are giving empty password. The next step is to enable SSH access to our local machine with the key created in the previous step. The last step is to test SSH setup by connecting to our local machine with user. This step is necessary to save our local machine’s host key fingerprint to the useruser’sknown_hosts file. RSA key fingerprint is 76:d7:61:86:ea:86:8f:31:89:9f:68:b0:75:88:52:72. There is no use in enabling IPv6 on our Ubuntu Box, because we are not connected to any IPv6 network. So we can disable IPv6. The performance may vary. For checking whether IPv6 is enabled or not, we can use the following command. If the value is ‘0’ , IPv6 is enabled. If it is ‘1’ , IPv6 is disabled. We need the value to be ‘1’. The requirements for installing Hadoop is ready. So we can start hadoop installation. Right now the latest stable version of Hadoop available is hadoop 1.0.3. So we are using this tar ball. We create a directory named ‘utilities’ in user. Practically, you can choose any directory. It will be good if you are keeping a good and uniform directory structure while installation. It will be good and when you deal with multinode clusters. Here the 2nd line will extract the tar ball. Note: If you are editing this $HOME/.bashrc file, the user doing this only will get the benefit. go to /etc/bash.bashrc file and do the same changes. Thus JAVA_HOME and HADOOP_HOME will be available to all users. Do the same procedure while setting java also. In hadoop, we can find three configuration files core-site.xml, mapred-site.xml, hdfs-site.xml. What actually happening behind the curtain is that, hadoop assumes default value to a lot of properties. If we want to override that, we can edit these configuration files. Open hadoop-env.sh file, you can see a JAVA_HOME with a path. Edit that JAVA_HOME and give the correct path in which java is installed. By default Hadoop stores its local file system and HDFS in hadoop.tmp.dir . Here we are using the directory /app/hadoop/tmp for storing temparory directories. Here the first line will create the directory structure. The third line will set the rwx permissions. Setting the ownership and permission is very important, if you forget this, you will get into some exceptions while formatting the namenode. Open the core-site.xml file, you can see empty configuration tags. Add the following lines between the configuration tags. A base for other temporary directories. The name of the default file system. In the mapred-site.xml add the following between the configuration tags. In the hdfs-site.xml add the following between the configuration tags. Here we are giving replication as 1, because we have only one machine. We can increase this as the number of nodes increases. Formatting the Hadoop Distributed File System via NameNode. The first step for starting our Hadoop installation is to format the distributed file system. This should be done before first use. Be careful that, do not format an already running cluster, because all the data will be lost. 09/10/12 12:52:54 INFO common.Storage: Image file of size 96 saved in 0 seconds. 09/10/12 12:52:54 INFO common.Storage: Storage directory .../hadoop-user/dfs/name has been successfully formatted. Here we have only one node. So all the hadoop daemons are running on a single machine. So we can start all the daemons by running a shell script. This willstartup all the hadoop daemonsNamenode, Datanode, Jobtracker and Tasktracker on our machine. The output when we run this is shown below. You can check the process running on the by using jps. Note: If jps is not working, you can use another linux command. The next step is to test the installed set up. If it is success list the created directory. If getting like this, the HDFS is working fine. If the output is like this, it is success. Mapreduce jars for testing are available with the hadoop itself. So we can use that jar. No need to import another. For checking with mapreduce, we can run a wordcountmapreduce job. The above shown are the programs that are contained inside that jar, we can choose any program. Here we are going to run the wordcount process. The input file using is the file that we already copied from local to HDFS. If output is coming, then our installation is success with mapreduce. Thus we checked our installation. For downloading hadoop tar ball.